Sometimes it’s the little things that make the biggest difference. Take cups, for example. Until this past weekend I’m ashamed to say that the cups in my cupboard had seen better days. 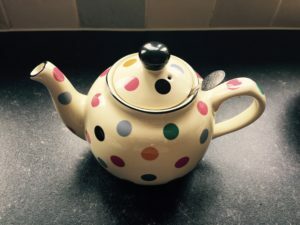 But it wasn’t until I was walking through the homewares department of John Lewis that I realised how dismal my mishmash collection of single-survivors-of-sets-of-four, hastily bought supermarket bargains, chipped, cracked, and handleless cups were. I was only passing through. On my way to the ladies clothing department on the first floor to return some pre-holiday panic buys. You know the kind. You’re leaving in two days and don’t think you have enough tops, so you grab a few from the rails and rush to the checkout before your common sense and years of experience can kick in. Then you get home, hoping that these’ll be the tops that’ll transfer your summer wardrobe to one of style, elegance, and sophistication; only to discover with a disappointing inevitability that would win you the lottery if you could just hone it in that direction, that they don’t fit, look like crap, and don’t go with a single other thing in your wardrobe. In this particular case of pre-holiday panic buying, for a bit of variety, it was a floaty top that’d look good on a stick insect, and some baggy trousers that were tailored to fit a stick insect. That’s not me. I have to admit, I thought that was me sorted. Until I passed the ‘reduced to clear’ stand and found these ones. 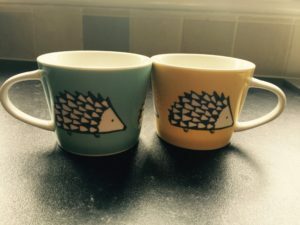 They’re made by British potter, Keith Brymer Jones, who as head of design at Made International, may well have had something to do with the hedgehog mugs, which were designed by a Made International collaborator, Scion Design! 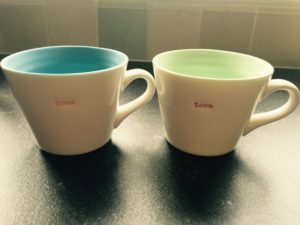 I love the simplicity of these mugs, and the colours inside. I’m planning on buying some more directly from his website: maybe another one of each colour and a couple of yellow ones. Then I’ll have something close to a grown up set of cups! So I was heading to the till with my new crockery balanced precariously in my arms (John Lewis need more/some baskets! ), when my eye was caught by a beautiful china mug. Bigger than the others, I realised that this would need to come home too. 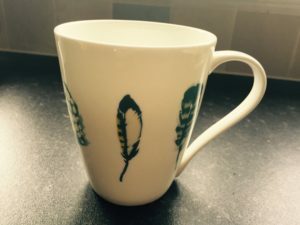 Safe in the knowledge that the husband has no use for such a large cup, I only needed to buy the one, which is just as well because it was the last one in the shop. It’d’ve been rude to leave it there all on its own… So pretty! So now I’ve thrown out all the chipped and crappy mugs, and the single survivors are heading for the charity shop. And every time I’ve had a cup of tea this week, I’ve derived a simple pleasure from drinking it from a beautiful cup. It really is the little things in life that make a difference.